Come Join Us For an Evening of Exceptional Cuisine, Oustanding Wines, and Amazing Musical Talents! 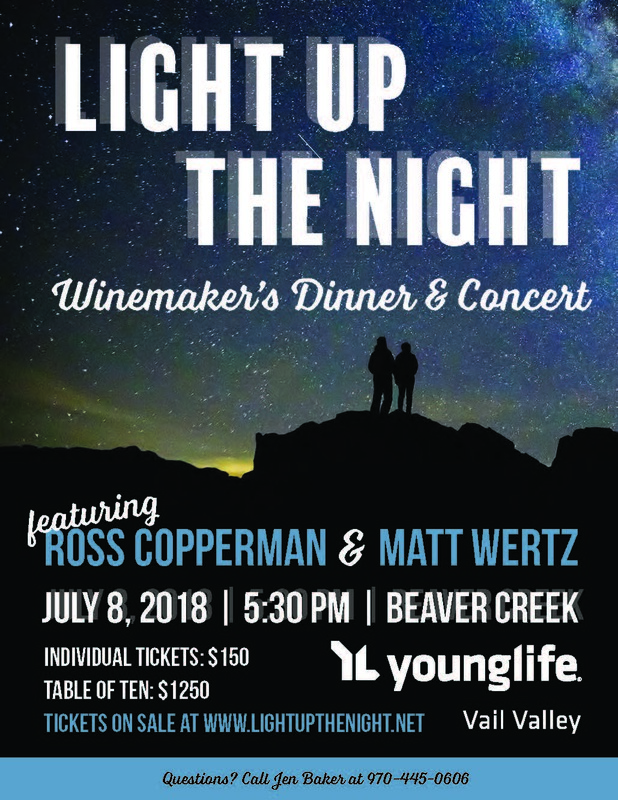 Young Life Vail Valley is hosting our 7th Annual Light Up the Night Winemaker's Dinner & Concert - and we’d love to have you join us. At this website, you can buy tickets for the event, make a donation, and learn more about our mission. This year we'll be bringing back the silent auction piece to our event and welcome donated items for the auction. Please click on the "Donate" button above to submit details about your item. Ross Copperman - A Grammy nominated American Singer-Songwriter! Songwriting credits include “Beat of the Music” and “Lose My Mind” (Brett Eldredge); " Woman, Amen", “Black,” and “Tip It on Back” (Dierks Bentley); “Noise” and “Pirate Flag” (Kenny Chesney); “Setting the World on Fire” (Kenny Chesney featuring Pink); and “Break on Me,” “Female,” and “John Cougar, John Deere, John 3:16” (Keith Urban). In 2016, Copperman was named country songwriter of the year by BMI. Matt Wertz - A nashville based singer/ songwriter who has released 9 albums and 5 EPs over the past 17 years and toured with artists such as Hanson, Gavin DeGraw, Jamie Cullum, O.A.R., Dave Barnes and Ben Rector. Thank you for supporting Young Life Vail Valley!